Photo: Club de Hockey Canadien Inc. 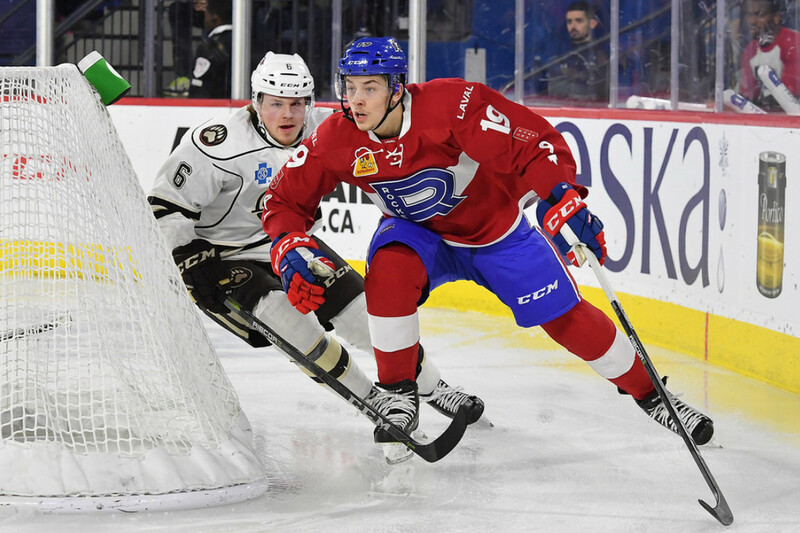 The Hershey Bears fell to the Laval Rocket 5-2 Saturday afternoon at Place Bell in Laval, Quebec. The loss drops the Bears record to 40-25-3-4 (87 points) on the season, keeping the Bears magic number for a playoff spot at four points. The Bears return to action Tuesday when they host the Lehigh Valley Phantoms at Giant Center. Game time is set for 7:00 PM. Scratches: Kris Bindulis (upper body), Garrett Pilon (lower body) and Riley Barber (upper body) were the injury scratches. Colby Williams was the healthy scratch. Nathan Walker was recalled by the Capitals on Friday. The Bears and Rocket skated to a scoreless first frame. The Bears outshot the Rocket 7-6 for the first frame. Hershey was 0 for 1 and Laval 0 f0r 0 on the power play in the first period. Shane Gersich led the Bears in shots with 2 for the opening frame. The Rocket opened the scoring with a goal from Hayden Verbeek at 8:42 of the middle frame. The break away was initiated by a poor cross-ice pass by Bears defenseman Tobias Geisser. The period would conclude with the Rocket leading 1-0. Laval led in shots on goal 13-9 for the second period, and led 19-16 after two periods of play. The Bears were 0 for 2 and the Rocket 0 for 0 on the power play after 40 minutes. Bears head coach Spencer Carbery shuffled the lines to begin the final frame. Most notably, Joe Snively moved from the fourth line to the second line and Max Kammerer was moved down from the second line to the fourth line. the Rocket would stretch their lead to 2-0 with a goal from Thomas Ebbing at 2:41 of the final frame, his first of the year. The goal was precipitated by a Bears turnover from behind their own goal. Moments later the Rocket would make it 3-0 with a goal from Alex Belzile at 5:02 of the final frame. The wheels would continue to fall off for the Bears. The Rocket would make it 4-0 with a goal from Xavier Ouellet at 6:01 of the final frame. The Bears would get on the scoreboard with a goal from Steve Whitney at 10:26 of the third period. Jayson Megna (22) was credited with the lone helper. The Bears would continue to climb back into it with a goal from Max Kammerer at 13:20 of the third period, making it 4-2. Ryan Sproul (18) was credited with the only assist. But the Rocket would answer, to essentially end the Bears comeback. Hayden Verbeek was credited with a goal that went in off of Steve Whitney’s stick at 15:55 of the final frame. With a little over a minute remaining, Ilya Samsonov would take a puck awkwardly to the midsection, and would have to leave the game. Samsonov left the ice under his own power, but appeared to be holding his right arm. The Bears had never lost to the Laval Rocket. The Rocket outshot the Bears 31-29 for the game. The Bears were 0 for 3 and the Rocket 0 for 0 on the power play. This entry was posted in News and tagged Hershey Bears, Jon Sorensen, Laval Rocket, Max Kammerer, Steve Whitney. Bookmark the permalink.